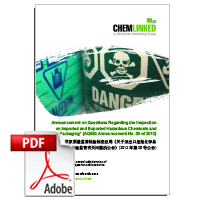 On February 29th, 2012, the AQSIQ reiterated its compulsory requirements on the inspection of entry-exit hazardous chemical products and their packaging in Announcement No. 30 of 2012. The announcement further clarifies documents required of Customs Clearance for hazardous chemicals import/export and the specific inspection items. It is also attached with two samples of the Declaration of Conformity for importers and exporters.